"I know well enough that there have been dogs so loving that they have thrown themselves into the same grave with the dead bodies of their masters; others have stayed upon their masters' graves without stirring a moment from them, and have voluntarily starved themselves to death, refusing to touch the food that was brought them." Yes, dogs and other animals do suffer from depression and loneliness. Every animal with a mind has the capacity to lose it and suffer from the same ailments as their human counterparts. in our animals helps us, as humans, to be better versions of ourselves. When we can help the least of those who do not have use of verbal language, then we have stepped into our best selves. It is comforting to me to discover and come to recognize that all animals and humans have the capacity to get lonely, sad, angry and depressed. When humans feel our most anxious, compulsive, scared, lonely and vulnerable we realize how much alike we are rather than how different. Just as we would mourn and grieve if the most important part of our lives would be removed from our sight, so do dogs. The bond between a loving owner and a beloved pet is so strong that when it is broken, it is very painful. Animal depression and loneliness have signs and symptoms much like those of their human partners. Here are some telling symptoms to watch for, but be aware there may be an underlying medical condition. If your attempts to return the animal to a more contented state, you may want to enlist the help of a professional. Changes in behavior. Is the dog so lethargic and tired that it no longer has the energy or interest in playing? Excessive sleeping. Even though it is common for animals to sleep often and deeply, this goes beyond that sleepy behavior. Overeating or lack of appetite. Just like their human counterparts, depression manifests often in either “too much or too little” appetites. Restless activity. I find myself searching for “a little something” when I am blue or depressed. Dogs do something similar. They are either looking for their beloved master or some answer to what has happened to their world as they knew it. Urinating indoors or having “accidents’ in the house. Often when human children become depressed or worried they relapse into a more infantile state of being. As a parent educator, I knew that what they were trying to tell us was “take care of me. I just don’t have the energy to do all the things I knew yesterday. I just want someone to hold me and reassure me that I am safe.” Your dog is telling you the same thing. Withdrawal inward. A classic symptom of depression is focusing inward at all that has been lost and trying to make some sense of what has occurred. Your dog may stop interacting with the human family as well as the other animal companions. Many of those who do not have animal pets do not believe the strong emotional bonds that exist between owner and pet. As a Pet Grief Coach, I know only too well how devastated owners are when their beloved pets die or become ill. 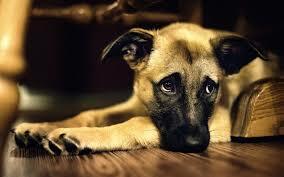 If one of the dogs’ siblings, housemates or the owner passes away, the dog may very well become depressed and lonely. If the owner is taken out of the picture, the pet may become devastated and overwhelmed with grief. Another aspect worth mentioning is that when an owner or the family who is caregiving a terminally ill owner is depressed and anxious, that is conveyed to the dog. Taking proper care of a pet takes lots of time, energy and emotion. If all the families’ energy is spent caring for an ill human the dog can feel the neglect. They may miss the ongoing, daily communication with the main human in their life. This may be the time to take up on the offer from neighbors and friends; “Call me if there is anything I can do to help.” Most people really do want to help but are not sure what to offer or how they can be the most assistance. Tell them that you would appreciate them including the dog on walks, runs and activities. When people offer to bring casseroles to feed the visiting family, ask instead for dog food that is the brand your dog is used to. This is not the time to be changing diets and offering new choices. Remember that animals grieve too. If it is possible to allow the dog to say goodbye to their beloved owner, do so. It has been shown that animals that are allowed to see the body of a sibling pet or owner have an easier time with the loss. That professional may be a veterinarian or even an animal communicator. I know that I used to raise my eyebrows at the thought of an animal and human communicating with thought, but I have been proved wrong. I am a Certified Pet Grief Coach and can assist the living humans to work through their grief and sadness. With a background of Hospice, Interview work and Family Relations Educator, you will feel safe and comforted with a few confidential sessions with me. At www.deathofmypet.com you will find many resources to help you and your pet at this difficult time. Judy Helm Wright has been called an intuitive wise woman who loves unconditionally. Find out more about her at www.judyhwright.com you will be glad you did.